pressing extension No. 1 button unlock. (indoor phone group calls switch "P"
When you pick up the receiver to press extension number ,the other party answer. It can do dual-way intercom. 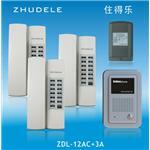 the other party answer , It can do Multi-way intercom.